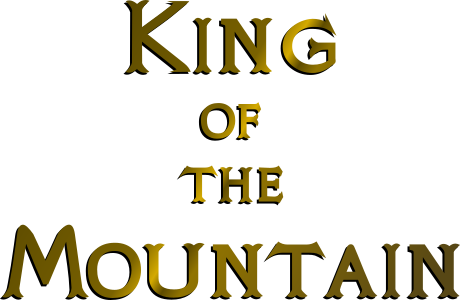 This page is here to preview/showcase King of the Mountain, a board game I am designing, which, like the other Great Big Project of my life—my book—may never be finished. King of the Mountain is a 2-4 player game that is loosely inspired by Parcheesi, Monopoly, Clue, Scrabble, Dungeons & Dragons, Magic: The Gathering, the Brothers Grimm, and an old board game called The Enchanted Forest that I adored as a kid. If I can ever rope enough willing participants in to give it a try, players will take turns trying to maneuver one of their six clansmen to the mountaintop in the middle of the board—which is when the real fun begins. In too many games (Parcheesi, Sorry, Trivial Pursuit, etc.) the first player to reach the goal—the alleged 'winner'—is rewarded by being unceremoniously kicked out of the action, while everyone else (the 'losers') play on, laughing and making merry. Not fun. In King of the Mountain, when you seize the Throne, you will begin a long, ruthless campaign to eliminate the rest of your smirking opponents from the game (think Monopoly, and you just built hotels on Boardwalk and Park Place) until you are the last man standing. Now, that is what I call a good time! There are dragons and unicorns and trolls, of course; giants and goblins and ghosts, a witch, a wishing well, gypsy traders and merciless mercenaries, and in the middle of it all stands a 10-inch mountain with a golden throne atop waiting for the strongest and boldest player to stake their claim in history and don the crown. Can't wait? Me neither! I hope to finish it sometime this year (2019), so if you're coming through Illinois and would like to spend your entire vacation huddled over a board game trying to make sense of a 100+ page rulebook, give me a call!